In the second beta of iOS 11.1, Apple has reintroduced the 3D Touch App Switcher gesture on devices that are equipped with 3D Touch. The feature was "intentionally removed" during the iOS 11 beta testing process and was not reimplemented ahead of the official iOS 11 launch, but Apple software engineering chief Craig Federighi promised it would be re-added in a future iOS 11 update. In an email to a MacRumors reader, Federighi said the feature needed to be temporarily removed in iOS 11 because of technical issues. 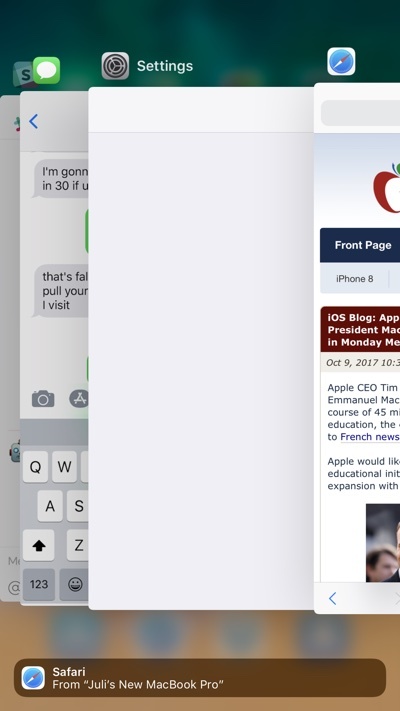 The gesture, first implemented in iOS 9, allows users with a compatible iPhone to 3D Touch at the left edge of the display to bring up the App Switcher. When it was pulled from the beta, many iPhone users were disappointed as it is a convenient method for switching between apps with a single gesture. Sans gesture, the only way to bring up the App Switcher on an iPhone is by a double press on the Home button. iOS 11.1 beta 2 is currently available for developers, but a public beta should be coming later this week. We're still early in the beta testing process, so it's not yet clear when iOS 11.1 will see a public release. I’m so happy about this. Missed this BIGLY! I wonder what sort of technical constraint would have caused the need to remove it.? This is exciting. For all the naysayers claiming 3D Touch is a gimmick, when they pull something like this, you notice how much you actually use it. Not when you are going to the previous app. Push down and swipe across the screen. Done. I’m enjoying this ‘listening’ Apple. There's now a toggle to manually turn off the Wi-Fi on the  Watch and force cellular in absence of bluetooth. It also displays the name of the Wi-Fi network! Thank You Apple. This is a MUST! Schweeet! Now all 22 of you on this forum can use it again! I sure hope you weren't "SAD." Another example of a half assed release. They FORGOT to add it back. Lmao.